Of this, Nearly Rs 16,63,929 Cr (60%) is spent on Rural Development, Agriculture and Allied activities and Fertiliser Subsidies. Below is the budgetary profile for FY20. Agriculture and farmer welfare (19%). 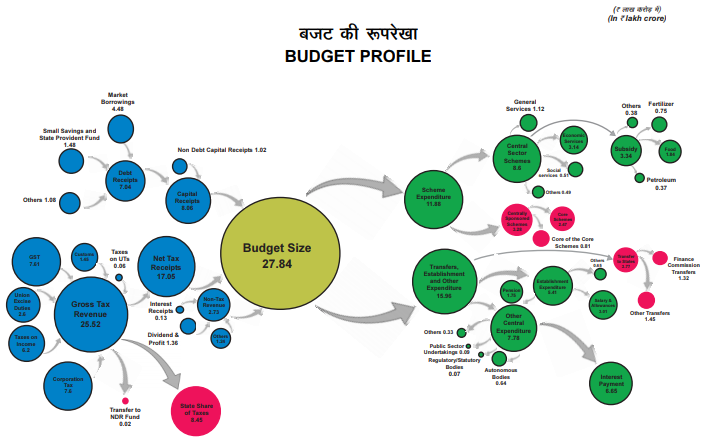 The below chart will help to understand how the extra Rs 3,26,965 Cr spending has been split in various segments. Subsidies have always been centre stage of India’s budgetary allocation and it appears they aren’t not going to vanish any time soon. 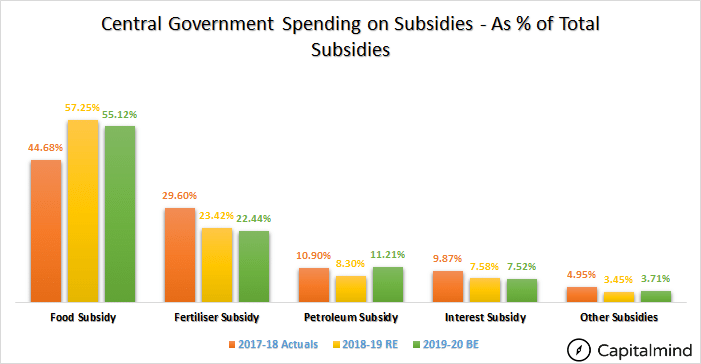 The budgetary estimate for subsidies for FY20 is at Rs 3,34,234 Crs. 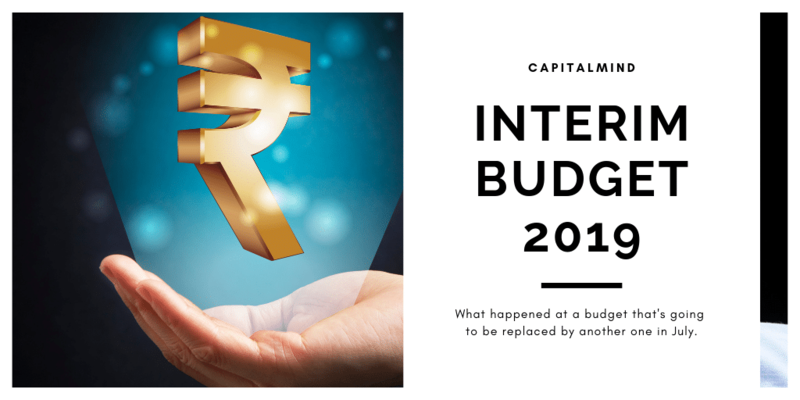 Which turns out to be 12% (12.2% for FY19 RE) of our total budget for FY20. The maximum spending has been for food subsidy (55.12%), followed by fertiliser subsidy (22.44%). The maximum increase in budgetary allocation was for petroleum. Petroleum Subsidy for FY20 has increased by 51% from FY19 RE. Most increase in budgetary spending has been for LPG subsidy. This is the new flagship scheme. A part of this scheme will be implemented under previous budget and rest depends on the next elected government. Under this scheme a small and marginal farmer with land holding of less than 2 hectares (roughly 5 acres) of land will receive Rs 6,000 income via direct benefit transfer annually. Meaning, straight into his/her bank account. The direct benefit transfer will be done in three instalments of Rs 2,000 each. Government has set aside Rs 75,000 Cr for the same in FY20. The programme will be implemented from 1st December 2018 itself. The beneficiaries will receive the first installment of Rs 2,000 by end of March 2019. This will cost a government Rs 20,000 Cr in FY19. Government estimates around 12 Cr farmers to benefit from this scheme initially. We believe this is not going to prove substantial relief for a farmer. A paltry sum of Rs 6,000 annually, which works out at Rs 500/month will not bring any drastic change in income levels of a farmer. Its more of a token amount before elections to appease the distressed community – and is perhaps based on the Rs. 8,000 per year income provided by the Telangana government which won elections back recently. Still, a direct transfer is better than doing numerous loan waivers, in terms of fiscal costs and moral hazard of making people believe they don’t need to pay loans back. Kisan Credit Card – the trademark for agricultural borrowers has been extended to farmers indulging in fisheries and animal husbandry. In line with interest subvention in agricultural loans, government has extended interest subvention of 2% to farmers pursuing animal husbandry and fisheries. And if the loan is repaid on time further 3% interest subsidy will be provided. A same kind of interest subvention has also been put in place for farmers who have taken loans in areas, which has been affected with a natural calamity. To qualify for this interest subvention, the natural calamity should be recognised by National disaster Relief Fund. For example, if you are a farmer and want to establish a fishery and require a loan of Rs 1,00,000: The normal interest rate given by a bank will be roughly 10%. You will get it at 8% now. (The government will pay 2%) Furthermore if you repay loans on time with interest than an extra 3% (Rs 3,000 in this case) will be credited back to your account. This is a good move. It promotes farmers to pursue allied businesses. The other added advantage is it ensures credit discipline is followed by farmers. Its important to bring awareness in farmers for timely payments of loans rather than just waiving off the loans. The whole interest subsidy for short term credit to farmers (inclusive of the above) has budgetary allocation for the same has been at Rs 18,000 Cr. , an increase of 20% from the FY19 RE. PMGSY has seen same allocation of Rs 19,000 Cr as last year. However the Revised Estimates(RE) for last year has been lower at Rs 15,500 Cr. MGNREGA allocation increased to Rs 60,000 Cr from 55,000 Cr in budget estimates. The RE for FY19 has been higher at Rs 61,084 Cr. Green Revolution, White Revolution and Blue Revolution saw a budgetary allocation of Rs 12,612 Cr, Rs 2,140 Cr and Rs 560 Cr respectively. A increase of 6.86% and 11.78% from 2018-19 RE for Green and Blue Revolution respectively. A decrease of 12% for White Revolution. Pradhan Mantri Krishi Sinchai Yojana saw an increase of Rs 15.33% from 2018-19 RE at Rs 9,516 Crs. Interest Subsidy to Farmers saw an uptick of 20% from 2018-19 RE. FY19-20 allocation at Rs 18,000 Crs. National Rural Drinking Water Mission saw an increased allocation of 49% from 2018-19 RE. allocation for FY20 at Rs 8,201 Crs. The Rural electrification programme (Deen Dayal Upadhyaya Gram Jyothi Yojana) saw an increased budgetary allocation of Rs 4066 Cr. A increase of 7% from FY19 RE. However last year 15,000 Cr were raised from extra budgetary request. Crop Insurance Scheme gets an allotment of Rs 14,000 Cr. A increase of 7.89% from FY19 RE. Under price support scheme, procurement of cotton was allocated Rs 2018 Cr. More than double of FY19 RE. Maintaining Sugar stock and payment of arrears to mill owners increased by 3.4 times to Rs 1,550 Crs for FY20. Pradhan Mantri Kisan Sampada Yojana saw a budgetary allocation of Rs 1,101 Cr for FY20. 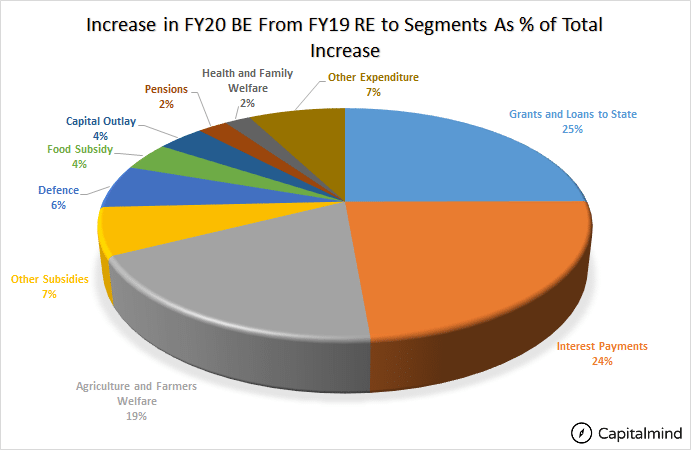 An increase of 26% from FY19 RE. For an interim budget, this is a lot of incentives being given to the rural sector. Announcing a Rs. 6,000 per year income to a farmer may not be in the best of form, because a new government cannot come in and reverse that easily, and the scheme is more populist than anything else. The comfort is that they didn’t do the Rs. 200,000 cr. type of income scheme instead. The interest rate subventions for farmers to set up new businesses and incentives to pay back on time are useful and the dreaded loan waiver isn’t back. But the real deal will be in the actual budget in June, with whichever government is elected. Still, the focus on this sector will be strong. We expect this to spike up rural demand in some way, because this is a small amount of increase in discretionary spending due to the higher income. At 0.75% of GDP, this may not do much, but it’s still better than a loan waiver. However, you can think of it as a voter bribe of sorts – our government gave you Rs. 2,000 before elections, they will say to the farmers.